Family farmers are the best people to achieve sustainability within agriculture according to a speaker at the International Summit of Young Farmers. 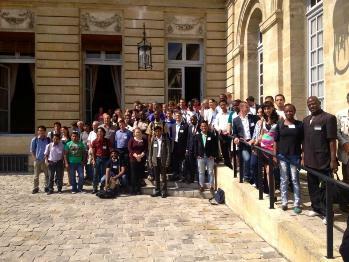 Representatives from 50 countries across five continents, including two members of NFYFC, were in attendance at the Summit in Bordeaux last week. A member from each country was invited to sign a manifesto to make family farming a solution for the future and implement proposals where possible. Lynsey Martin and Catherine Bennett represented NFYFC at the Summit and learnt about how other countries rely on family farming and how young farmers can be helped in the future. Lynsey signed the manifesto on behalf of the NFYFC. Catherine said: "The aim of the summit was to foster and intensify young farmers and to provide concrete solutions for family farming in the future. We learnt that family farming represents 40% of the world's active population." "The main points of the manifesto were for people to recognise farming as a true profession both socially and politically, to help set up young farmers on family farms and to put family farming at the centre of territory development. "It was fascinating to hear how important family farming is in other countries around the world. We both picked up on how agriculture was appreciated in other countries for example, 80% of Kenyans rely on agriculture and a high amount of these are small scale family farms. This put into perspective the agenda for agriculture in other countries compared to the UK. "I think it's really important for NFYFC members to be aware of what other countries are doing and how we can learn from their practices." NFYFC's presence at the summit was made possible thanks to the support of HOPS Labour Solutions and Mole Valley Farmers. Young Farmers’ Club members put their talents to the test in an enthralling NFYFC Farm Skills Weekend across Shropshire and Staffordshire. Dozens of competitors across England and Wales were given the opportunity to show off their skills in the field of all-terrain vehicle (ATV) manoeuvring, fence-erecting and Defra-supported stockjudging. In an action-packed weekend, organised by the National Federation of Young Farmers’ Clubs (NFYFC), 24-year old Peter James from Leek YFC took home the coveted NFYFC Stockman of the Year award, beating 15 other competitors to the prize. 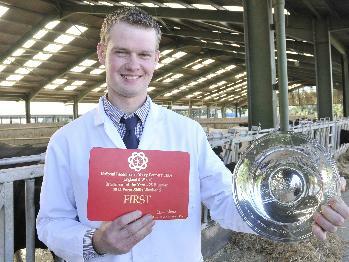 Peter was also part of the Staffordshire YFC team that won four out of five stockjudging trophies at the English Winter Fair in 2013. The weekend kicked off at Harper Adams University College in Newport, Shropshire. Five counties battled it out in the Side By Side ATV competition, negotiating a tough obstacle course, hitching a trailer and demonstrating their first-aid skills in a mock farm accident. Cornwall YFC (below right) pulled out all the stops to take first place in the competition ahead of Cumbria and Herefordshire. The winning duo of Brett Burchell and Jonathan Melhuish were also awarded an additional trophy for demonstrating the best teamwork. Harper Adams also played host to the Betafence Fence Erecting competition on the Sunday. On a very hot day for the participants, it was Wales that came out on top, with Montgomery YFC taking first place, beating second-placed Herefordshire and third-placed Somerset. 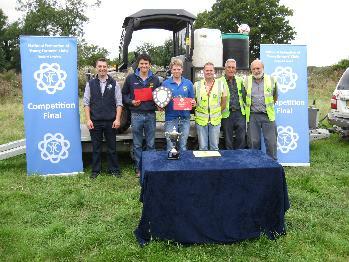 And Wales had even more reason to celebrate at the Young Stockman of the Year competition at White Cross Farm in Stafford. In a field of 18 competitors, 17-year old Elin Havard (pictured above) from Brecknock YFC took home the top prize. Grace Whitcombe from Somerset came second and Chloe Harris from Herefordshire came third. A full list of results from the Farm Skills Weekend can be found on the NFYFC Results page. A wide range of photos from the weekend can be found on the NFYFC’s Facebook page. 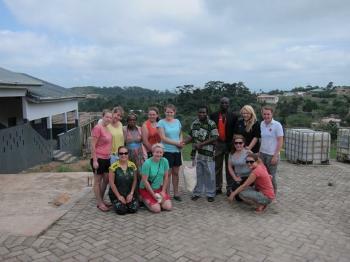 A group of Young Farmers have returned to the UK after an unforgettable volunteering trip to Ghana. 10 young explorers were lucky enough to be selected for the trip in October last year and spent two weeks learning about a completely different culture. A trip that filled with farming, painting and entertaining children left the team blown away by an entirely new experience. Bethan Ellis, group team leader, said: "The process started in October when the details of YFC Travel trips were released. We filled forms in and went for an informal interview at the NFU Mutual Headquarters in Stratford. 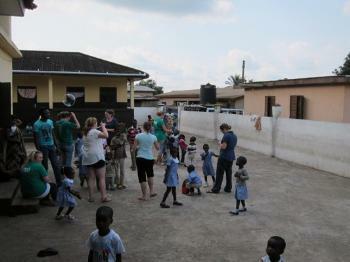 Eight months later, having done our fundraising, we were jetting off to Accra, the capital city of Ghana. "Our days consisted of working in the mornings, either painting or farming then returning home for food and rest before visiting a Day Care Centre in the afternoon to entertain the children. Following a week of painting at the Christian Unity Prep School in Mampong, we were presented with gifts from the headmaster, teachers and the PTA and thanked for our help. The experience will stand out in our minds because of the dodgy rat infested toilet block and the football pitch we had to drive across to reach the school, sometimes with a game in mid-play! "A week spent farming consisted of feeding and cleaning the animals, raising beds, weeding the maize (with a machete!) and planting cassava, plantain and tomatoes. We also visited a farmers market, palm wine factory and a gari making plant and had the chance to see how Ghanians make a living from farming." 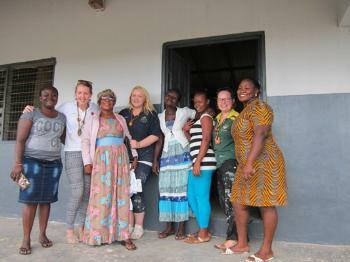 In between the hard work the team got the chance to see Ghana’s rich, vibrant culture, ranging from cooking, dancing and drumming lessons, a visit to a bead and wood market and broom making. Bethan said: "We also had the chance to visit Cape Coast, where we were given a tour of an important castle during the slavery era and given an eye opening account of the way slaves were treated. Following this we visited the Kakum rain forest where we bravely made our way across the ropey untrustworthy ladders of the canopy walkway – a rope ladder suspended 40 metres above the floor." "Although we only spent two weeks in Ghana, we got to see how the real people lived by staying with a family and joining in with their life. The people there have a completely different take on life and couldn’t quite understand our descriptions of life as British Young Farmers! "The YFC Travel programme gave us a chance to live life in an entirely different environment and culture and we encourage anyone who wants to travel to give it a go and to take advantage of the trips on offer." Young Farmers now have the opportunity to apply for next year's YFC volunteering trip to India. Details for this trip, plus all other 2015 YFC Travel adventures can be found on the website. Ten26 Summer Edition is out on Monday! 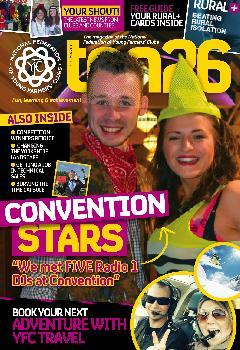 The latest edition of Ten26 magazine is out on Monday and once again full of great stories from the world of NFYFC. In the summer edition, we take a look back at a fantastic 2014 Blackpool convention and look ahead to the YFC Travel programme for 2015. 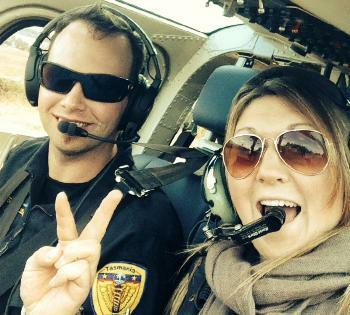 We also read about the experiences of Young Farmers from this year's travel adventures. There is also some great article about NFYFC's Rural+ campaign and how becoming a Young Farmer can be good for your mental health. NFYFC is always on the look out for great news stories from YFCs across the country for future editions of Ten26. To have your story featured in the next edition of Ten26, simply send your stories and photos to magazine@nfyfc.org.uk. What Will Your Discovery Be in 2015? Details are now available and applications are being accepted for NFYFC's 2015 Travel Programme. Once again, Young Farmers will be able to apply for the trip of their lives and learn more about different cultures all over the world. NFYFC offers all its members the opportunity to take part in YFC Travel - a unique programme of exciting trips, home stays and working exchanges to destinations around the world. Next year also includes some new trips, including a Homestay in USA and a volunteering trip to India. You can read about what's on offer in 2015 on the YFC Travel homepage. Applications must reach the NFYFC office no later than Friday 14th November 2014. NFYFC will only accept applications signed by the applicant and a member of staff from the YFC County Office. Applicants will be required to attend a YFC Travel Selection Day on Saturday 6th December 2014 at The Quality Hotel, Birmingham Rd, Coventry, CV5 9BA. You can also read more about the experiences of some of our Young Farmers this year in the next edition of Ten26, which is out next week. Parbold YFC have put their name on the world Tug of War map by performing valiantly at their first internation tournament. Just weeks after their second consecutive first place at the NFYFC national Tug of War championships, the team showed off their skills at the 2014 GENSB tournament in Folkestone, Kent. The team were battling it out against 39 teams from 9 different countries. The competition was split into 4 groups with the top 4 teams in each group progressing to the knock out stages. Despite competing against some very strong international teams, Parbold put in a great performance and finished 5th in their group - just missing out on a place in the knock out stages. David Hamer, Chairman of NFYFC Competitons steering group, said: "I am absolutely over the moon for what Parbold young farmers have achieved. It is exactly what I wanted when I brought GENSB Tug of war to NFYFC. The experience those young people have just had this weekend will stay with them for the rest of their lives." The Parbold team have already expressed their interest in attending the 2015 GENSB competition in Heino, Netherlands, which again will be on the August bank holiday weekend. The GENSB competition is open to any team to take part in, and there is no qualification route to the competition, so any YFC team wishing to compete next year should keep their eye on the GENSB web site at www.gensb.eu or contact the Tug of War Association for info via www.tugofwar.co.uk. Photos from this year's event are also available via the Tug of War Association Facebook page.